When you’re remodeling your home, you want to be able to have your own personality worked into the design process. One way to work personal style into the design is to find a way to display treasured possessions. Another way to define your style is to find design elements that compliment those treasured possessions. For example, you may like to collect beautiful glassware and use decorative picture frames. In that case, perhaps you would like special decorative hardware to accessorize your bathroom. Decorative cabinet hardware is a great way to express personal style. There are a wide range of styles that make the selections nearly endless. 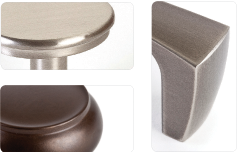 From basic handles and knobs to many different sorts of ornate designs, there are options for every aesthetic. This feminine bathroom vanity vignette in our Mansfield showroom is an example of personalizing traditional cabinetry with feminine touches, such as the sparkling chandelier and decorative hardware. Imagine adding crystal picture frames and perfume bottles to complete the elegance. 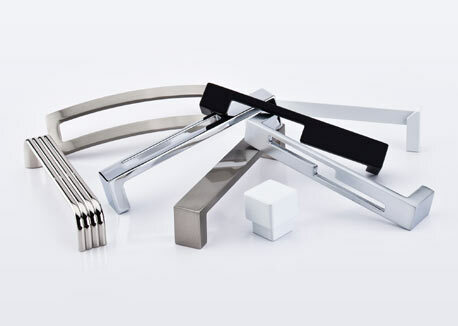 If you want a luxuriously feminine vanity, consider Schaub Crescendo decorative hardware, which looks like jewelry. Keep in mind that fancier hardware can add up in price quickly, so be sure to keep budget in mind and not go overboard. It’s also extremely important that style and function go together with hardware. 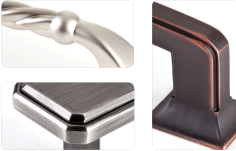 We have plenty of articles concerning how to choose decorative hardware that you can check out for further information. In the kitchen, there are many options for display cabinets to show off fancy dishware and other treasured fragile items. In the Kitchen Views showroom in Mansfield, MA you can see how open corner shelves can display large pottery and a cabinet with glass doors can display glassware. Glass door display cabinets could be either frosted or colored transparent glass, which can add a degree of mystery, or even plain glass to put items on full display. You could also have shelving in areas that might otherwise go unused, such as in cases where a regular wall cabinet may not fit, or otherwise empty wall space. This sort of shelving is perfect for displaying books or knick-knacks, depending on your personal style. If you’re a wine aficionado, there are many options for open wine cabinets, available from many major kitchen cabinet manufacturers. Some allow you to even show off your wine glass collection. These sorts of cabinets can serve many purposes and if you decide on more custom options, the possibilities are endless. Whatever your space considerations and how subtle or grand you want your style to be portrayed, try to keep your design choices as timeless as possible. Hardware can typically be swapped out easily, and display cabinets and shelves can be used for just about anything. When consulting your kitchen and/or bathroom designer, be sure to let them know about your favorite things so that they can help you incorporate them into the final design. 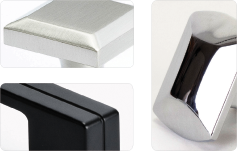 Top Knobs recently introduced a unique concept in cabinet hardware with the Passport Collection, which is inspired by world-renowned destinations such as the Great Wall of China, Australia’s Sydney Opera House, London’s Tower Bridge, the ancient Egyptian city of Luxor, Africa’s Victoria Falls and Rome’s Trevi Fountain. Each of the Passport Collections offer many different finishes, including Brushed Satin Nickel, Polished Chrome, Polished Nickel, Pewter Antique, Tuscan Bronze, German Bronze and Light Bronze. Each collection includes exquisitely shaped knobs, pulls, handles, appliance handles and more, offered in a wide variety of sizes and designs. 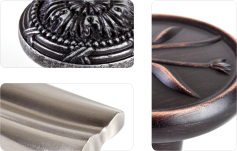 This year, Top Knobs released their new Sanctuary II collection of decorative hardware. This collection was designed to meet a growing demand for contemporary and transitional styles, featuring clean, sophisticated lines. The Sanctuary II line is available in six finishes including new white, aluminum and stainless steel pieces. All thirty knobs and pulls are designed to be mixed and matched, making for many different unique combinations. 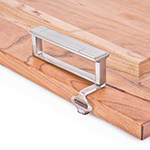 These and many other cabinet hardware possibilities are available from Kitchen Views. When selecting the hardware for your new cabinets, it’s a good idea to order at least two pieces more than what you actually need, especially if the hardware is special order. Put the extras away in one of the drawers, so that you will have them handy in the event that a piece of the hardware on the cabinets should get damaged or broken. Two years ago, I had a customer who bought some very nice cabinet hardware with porcelain inserts, but purchased only the exact number of pieces that they needed. Recently, the porcelain on two of the handles broke. The customer came in to get replacements, but the manufacturer had gone out of business and we could no longer match the hardware. As a result, the customer had to go through the trouble and expense of replacing all the hardware in the kitchen because they hadn’t gotten a couple of extras to begin with. 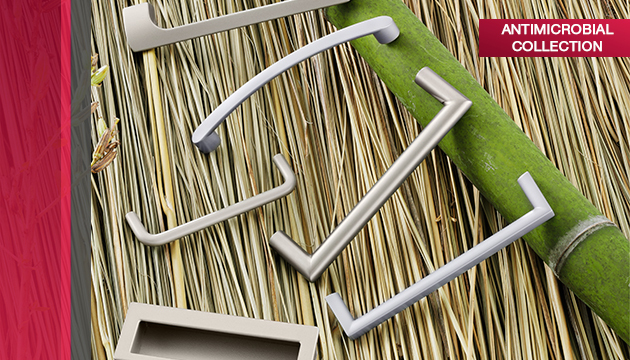 So, those extra two pieces of hardware stashed away in that drawer – they’re cheap insurance! 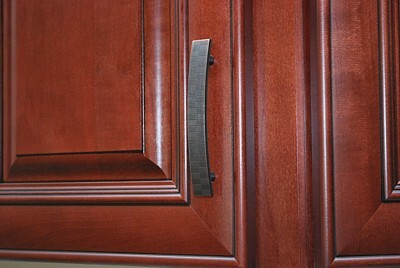 Many customers have a difficult time deciding on the hardware they want to put on their cabinets. Most people don’t have a problem selecting a finish that they like, but the question becomes do they want all knobs, all pulls, or some combination thereof? I have seen installations where knobs or pulls were used throughout and they look fine. 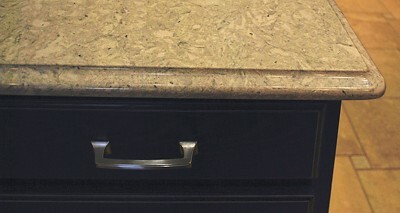 Some customers will opt for a combination, using knobs on the doors and pulls on the drawer fronts or vice versa. The truth of the matter is there is no right or wrong way to do it. Choose what is visually appealing to you and something that you will be comfortable with. Some people elect not to put any hardware at all on their cabinets. However, I do not recommend this. No matter how clean your kitchen is or how careful you are, over time, the natural oils in your skin will eventually cause a discoloration in the finish at the point where you touch the door or drawer each time you open it. An attractive hardware selection that coordinates well with the style and colors of your cabinets and countertops can provide a lovely finishing touch to your beautiful new kitchen.